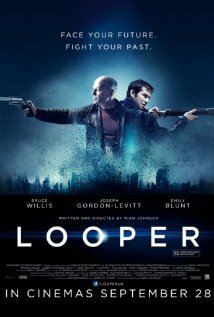 Available today on demand and in your queue is Looper, the kind of movie that nourishes any underfed love of Science Fiction. Joseph Gordon-Levitt plays Joe, a young hood in a dystopian future. When the mob wants someone wacked, they send him in a time machine back to Joe – no body, no messy investigation. Then one day they send even-more-future Joe (Bruce Willis, in his second great performance this year) back for Joe to wack, and all hell breaks loose. The result is the best action film, best SciFi film, and among the best films period of 2012. It’s a heady, confident, fascinating adventure that should not be missed. If you enjoy it, you’ll definitely want to give writer/director Rian Johnson’s feature debut Brick a chance. A hardboiled film noir given a David Lynch feel and set in an LA high school, the film works a magic spell. Gordon-Levitt again stars, this time as a high school outsider turned flatfoot trying to piece together a dame’s murder. For all its familiarities, Brick is wildly unusual and absoltuely fascinating viewing.